Deciding upon the best event space or venue is critical to your event's overall success. While venue planning takes time, it doesn't have to feel overwhelming. For many, professional event planners and amateurs alike, it can be a fun challenge. 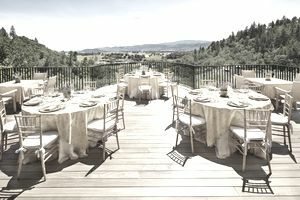 Assuming that you have already identified the type of event you are planning and its purpose, there are many other factors must be considered as you begin the process of selecting the venue itself. The following this roadmap will help guide you through steps in choosing the perfect event space. When venue planning for an event, one of the most important pieces of information you must know is who your guests will be and how many you expect to attend. While the type of event will certainly inform the venue choice, one of the largest limiting factors for an event space is its capacity. Make sure that you know at least an accurate estimate (it can be a range) of the number of guests as this will immediately limit your venue options. You should also consider your audience. Be sure that the venue reflects not only the event itself but the guests' tastes and expectations. When are your guests most likely available to attend based on their schedules? What venues have appropriate and available space for those times? When is the best time for your management team to hold the event? With an open-ended budget, anyone can plan a great event and have an infinite selection of venue choices. But more than likely, your financial resources are limited, and you should be aware from the beginning of what your financial limitations are - even if your event budget is simple a ballpark estimate or range. An event planner can always plan a great event within a reasonable budget. Do the venues fall within your budget parameters for space, technical and catering expenses? Have you negotiated a favorable rate for services and demonstrated the value of your role? Have you allowed flexibility in your budget in case line item expenses exceed the plan? Based on the theme of your meeting, what three best locations come to mind? Where would your guests prefer to attend this meeting? What will be most convenient for your guests? Other than a hotel, what unexpected locations could increase the RSVP rate? Does the event venue meet the special criteria of your program or event? Can the venue accommodate your production, entertainment, A/V, sound, and other technical needs? Does the condition of the facility reflect the high standards of your organization? Does this venue offer good parking options or valet? Does this venue offer security? Does this venue offer additional services like catering, floral arrangements, linen and table rentals, etc.? Does this venue have a setup and clean up crew? Does this venue restrict what other vendors you work with? Does this venue have food and beverage minimums? What is the tenure of the conference manager, catering manager, or executive chef? Will the management treat you like a VIP client or just as one of multiple programs? How much flexibility is the venue willing to extend to you? Do they have testimonials or reviews available? Does the venue offer photographs from events similar to yours? Unless logistics and time prevent it, every event planner should conduct a site inspection before contracting any venue. Pictures can be extremely helpful, but there are many aspects that can only be evaluated in person. Ask for a tour of the venue including everything from the parking to the entrance and the event space to the bathrooms. You'll be glad you did. Event planners must present their venue recommendations to their client (whether that be an internal client like company executives or management or an external client) and obtain approvals. The only question to ask yourself with regards to the client during the venue planning phase is will the client approve the recommendation(s)? To be able to answer that question with some confidence, you must make sure that you understand the client's expectations and preferences from the beginning. Event Management vs. Planning: What's the Difference? What Are Some Tips for Planning Your Employee Holiday Party?